Bedside settlement cart is produced for hospitalization bedside settlement services according to the hospital needs, the window settlement transferred to the bedside settlement directly, eliminating the patients` back and forth time, Through the public card, cash, health insurance card, bank card and other payment methods, by the bedside settlement car, just need 5 minutes, the patient can complete the discharge procedures, bring real convenience for the patient. 1. Bedside settlement cart is produced for hospitalization bedside settlement services according to the hospital needs, the window settlement transferred to the bedside settlement directly, eliminating the patients` back and forth time, Through the public card, cash, health insurance card, bank card and other payment methods, by the bedside settlement car, just need 5 minutes, the patient can complete the discharge procedures, bring real convenience for the patient. 2. In the hospital outpatient hall peak period, in order to ease the payment pressure, bedside settlement cart can be used as mobile toll collection, can greatly shorten the patient queuing payment time. 3. In the hospital floor clinics crowded peak period, bedside settlement cart as mobile toll window, reducing the patient waiting time, so that patients with acute severe illness can be timely medical treatment. Carts can be equipped with one machine computer, printer, mobile POS machines and other equipment, relying on the hospital wireless network to support social security card, prepaid treatment fees, bank cards, cash and other payment; in addition to pay, you can also prepaid recharge machine prepaid billing business. 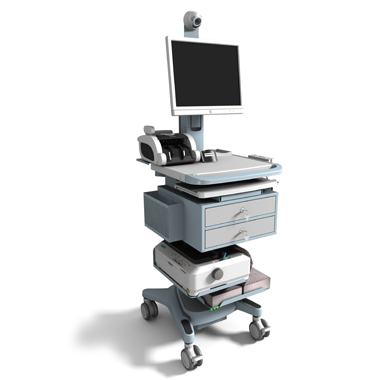 Looking for ideal Smart Mobile Medical Carts Manufacturer & supplier ? We have a wide selection at great prices to help you get creative. All the Bedside Settlement Cart are quality guaranteed. We are China Origin Factory of Powered Medical Carts. If you have any question, please feel free to contact us.